A small street from Victoria Embankment that leads into Whitefriars St connecting to Fleet St. The area is full of history of newspaper men and religious men. I'm on a mission to find out more. ooh oooh ... I walked part of that area when I was in London in October just gone. Okay ... got my boots on .. ready when you are to explore! Thought I knew London pretty well, but you keep on showing me new interesting locations to explore. Lovely! Thanks. Ciao. A. 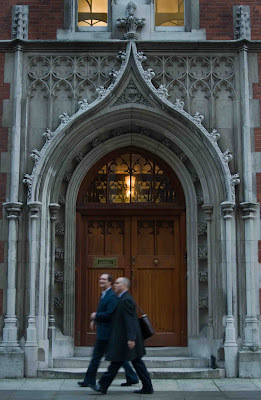 That is a beautiful entrance framing those smartly dressed businessmen! Fantastic entrance! I like the composition too. Very smart looking door (understatement!) The two pedestrians are a great bonus. Now go and find out more. I want to "read all about it!" I enjoyed this photo. It made me long to be in London again. Oh, how I love that place! Moreso every time I see photos like this. Please keep posting wonderful shots!